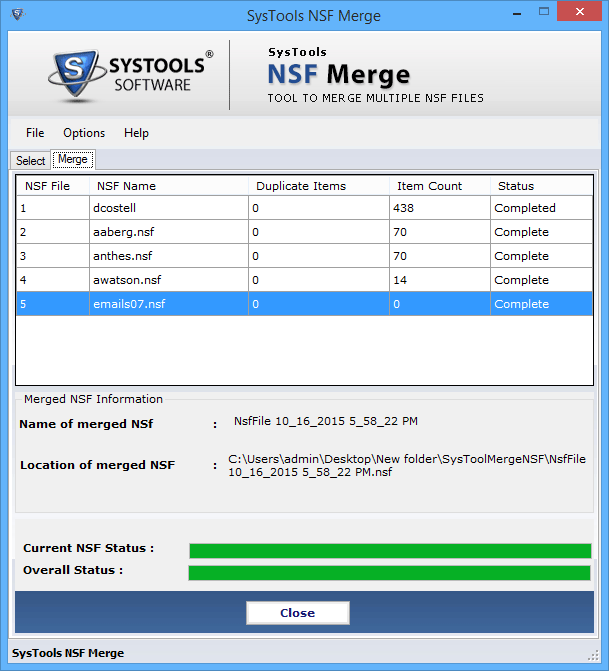 Merge multiple NSF files with the help of NSF merger tool. The NSF File Merge Software is programmed to combine Notes database files together to offer a manageable single storage. A freeware trial version enables software trial before investment being made. Notes databases can be merged from multiples to a single storage with the help of NSF Merge tool. The NSF Merge Tool offers Merge option to combine all the databases into a common mailbox for better and enhanced manageability. Besides Lotus Notes NSF merge, Software features an option namely, ‘Join’. This enables combining databases in multiples but without merging common folders across the processed NSF files. Each folder is auto incremented for being distinguished. You can combine the complete mailbox data while merging databases together. The NSF Merge Tool is programmed to combine not just email folders but the rest of the data too. This includes all mailbox contents such as, address book, calendar items, and more. Unnecessary data can be excluded from being merged to save time and storage space. You can exclude duplicate entries, if any, from being merged. Once the option is enabled, the tool will auto-detect duplicates and eliminate them from being merged. Similar to duplicate entries, the users can customize database-merging process by preventing Deleted Items folder from being combined. 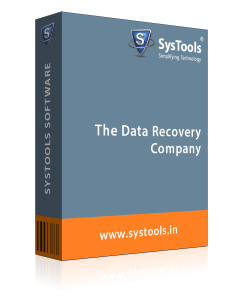 This enables the generated output to have more storage space and less unneeded data in it. Further customization is featured and supported by the application to improve user experience. You can change the display name of the output NSF file generated post merging the processed database. This makes it easier to distinguish the file. Q. How will I be able to merge a Notes database without User ID file? 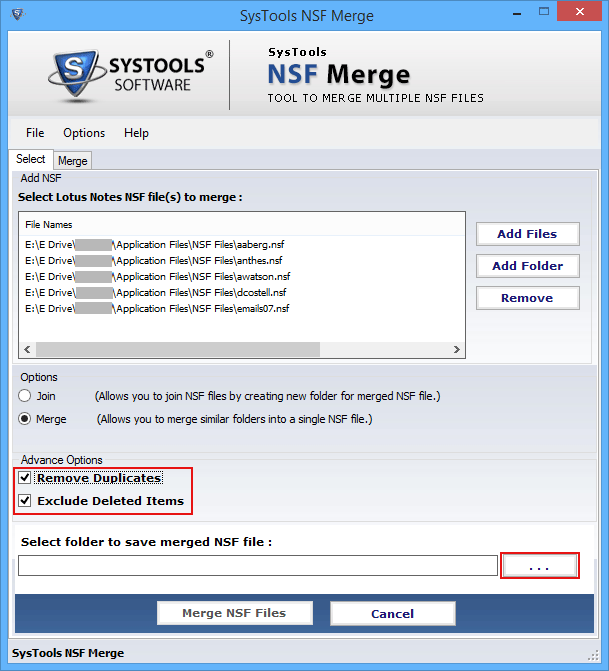 Ans: NSF Merge software doesn’t require you to have User ID file at the time of merging databases. Therefore, you can make use of the respective software to merge NSF files successfully without surfacing any technical glitches. Q. What is the procedure to open and combine multiple NSF archives? Ans: NSF File Merge is the perfect solution to merge Notes databases whether profile database or archives. There are no such technical limitations in merging NSF files with the help of NSF file combiner. How to Merge NSF using the Product? Step 1: Open NSF Merge tool from the installed location or Go to Start Menu » All Programs » NSF Merge. 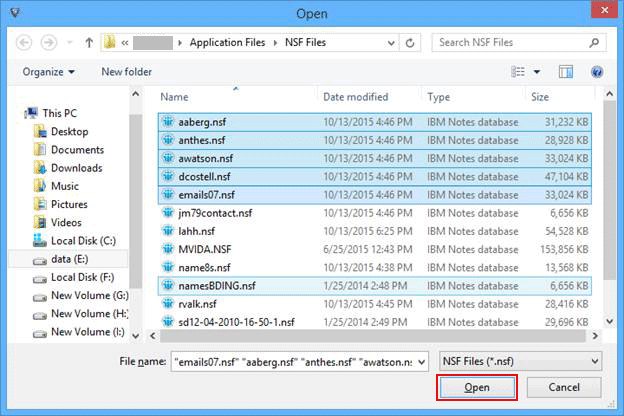 Step 2: Click on the "Add Files" button to manually add NSF files individually or "Add Folder" to add the entire folder containing the files to be joined. The NSF Merge Software scans and display them in the adjacent pane with File Names and their source path. 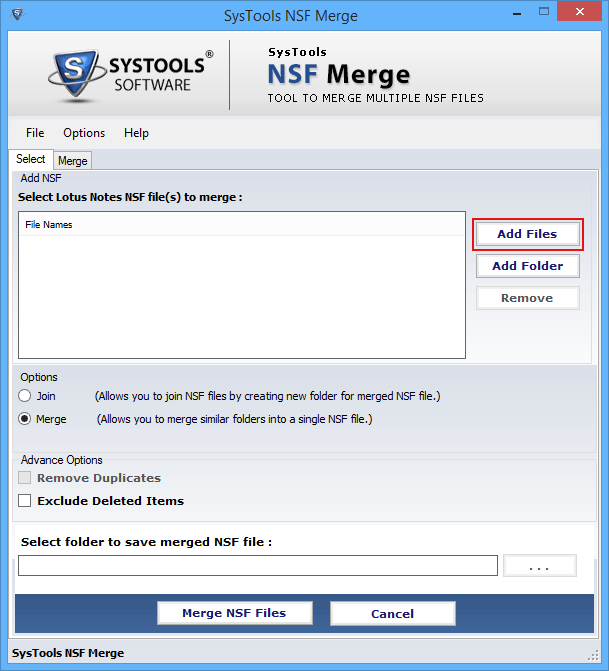 Step 3: The NSF Merger gives many options to join NSF files such as Join & Merge. Step 5: When you implement Join operation on Lotus Notes Archive Files then there is one option available to filter the Exclude Deleted Items only. 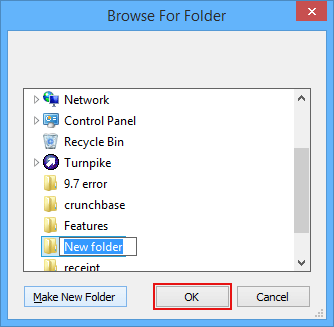 Step 6: Choose the Folder to store the combined NSF File. Step 7: Click on the "Merge NSF File" button to start the process. Step 8: when the process start you can go through the live status of combining NSF files process. Step 9: After getting notification message (The process is completed successfully).